With the kids having 6 weeks off school for the summer and the weather being appalling most days, we were lucky to receive some indoor entertainment in the form of a new Wii game. 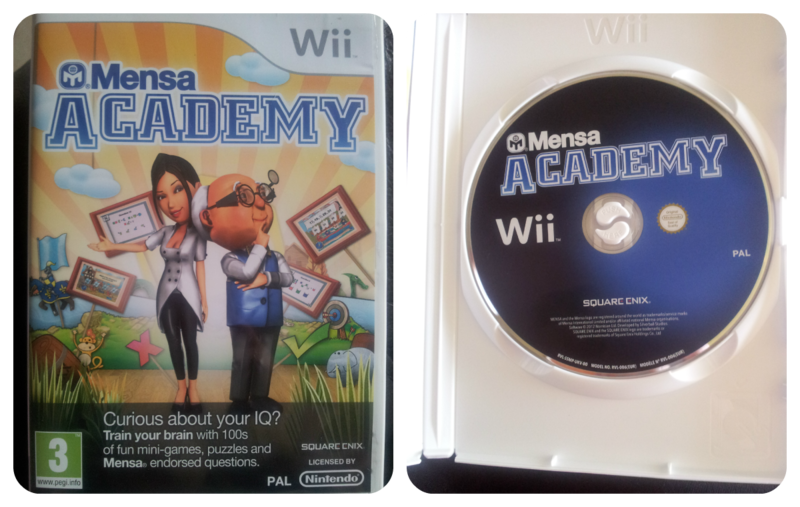 The Mensa Academy allows you train your brain with a variety of over 100 puzzles and mini-games. With genuine Mensa questions you can find out your Mensa score in a matter of minutes and as the game is PEGI rated 3 it's suitable for all ages. After slipping the disc into our console we found the game very easy to play. Although an instruction manual is included in the case we didn't require it. The interface is easy to navigate and you can choose between Solo and Party (multi-player for up to 4 people) with the option to create 3 user profiles beforehand. In solo there are Play, Test and Coach modes. In Play and Coach mode there are further options of game categories; Language, Numeracy, Visual, Memory and Logic where you train to achieve medals or play to complete levels. In Test there are 30 questions to be answered within 15 minutes on a variety of subjects. I managed to achieve a score of 110 which apparently is 'very acceptable' but it made me want to play more to improve it - I am rather competitive, even with myself! Solo play is more for older children and adults. Jamster found it a little dull but for the Mr and I it is a great way to keep our minds working with the challenges to a timer. The Mini Mes definitely enjoyed the multi-player games however. In Brain Race you can select a particular category or choose a variety of them all and it's the first to the finish that wins. With Brain Fighter you have 10 lives and upon answering questions correctly you can gain a shield to defend yourself, or bombs to throw at your opponent(s) to knock them out. The last to stay in wins which the kids loved - educational yet fun! We enjoyed playing the game and although the Mr and I will use the Solo option I feel as though the children are still too young (6 and 8) to enjoy and appreciate this part of Mensa Academy fully. The Party section will be used often though by us all, when friends and family visit and for family nights in. The game is due for release on PC and games consoles in September on console/PC and late August to mid-September for DS.